* This is my guest article in No Tricks Zone yesterday. The Philippines enacted the Renewable Energy (RE) Act of 2008 (Republic Act 9513) that contains various subsidies to renewables like feed-in-tariff (FIT). While it was signed into law in December 2008, FIT was not implemented until July 2012 because many sectors including manufacturing opposed higher price on already expensive Philippine electricity rates. But the World Wildlife Fund (WWF), Greenpeace and other environmental groups in the country lobbied hard to implement the FIT and the Energy Regulatory Commission (ERC) was pressured to grant their lobbying, but at a lower rate as requested by the National Renewable Energy Board (NREB). Prior to July 2012, there were not many renewable plants that were put up because of the uncertainty when the FIT will be granted and implemented . After July 2012, there was certainty and more renewables were put up. Last February, Manila Electric Cooperative (Meralco) and all other electric cooperatives and distribution utilities in the Philippines started collecting the introductory FIT of PHP 0.04 per kWh. If this rate is retained throughout the year, projected collection by Transco that it will distribute to the renewable firms would be PHP2.7 billion. If the 12 percent VAT is included, this will be a P3.02 billion (US$ 68.3 million, at prevailing P44.2/$ exchange rate) leakage from the pockets of electricity consumers nationwide. FIT rate will be adjusted and rising through time as more renewables are added to the country’s power generation mix. Rising FIT has happened and continues to happen in Germany, which probably has one of the world’s most elaborate renewables subsidy schemes. The FIT keeps rising as more renewables, wind and solar especially, are added yearly to the energy mix and electricity distributors are forced to buy them even when cheaper electricity from coal, natural gas, nuclear and hydro are available. 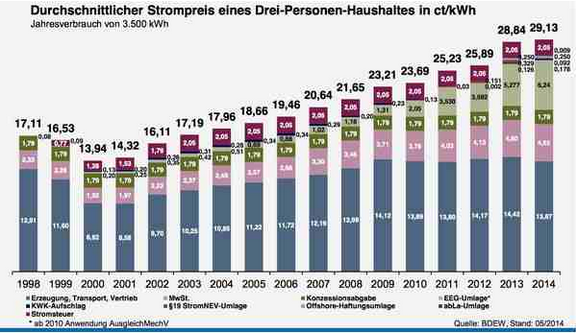 Source: BMU Germany’s Electricity Price More Than Doubles…Electrocuting Consumers And Markets, 7 December 2014. 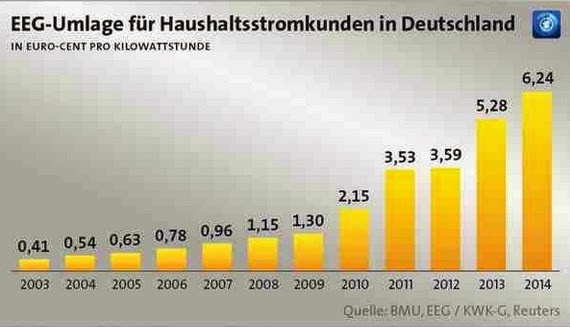 So electricity prices in Germany keep rising. 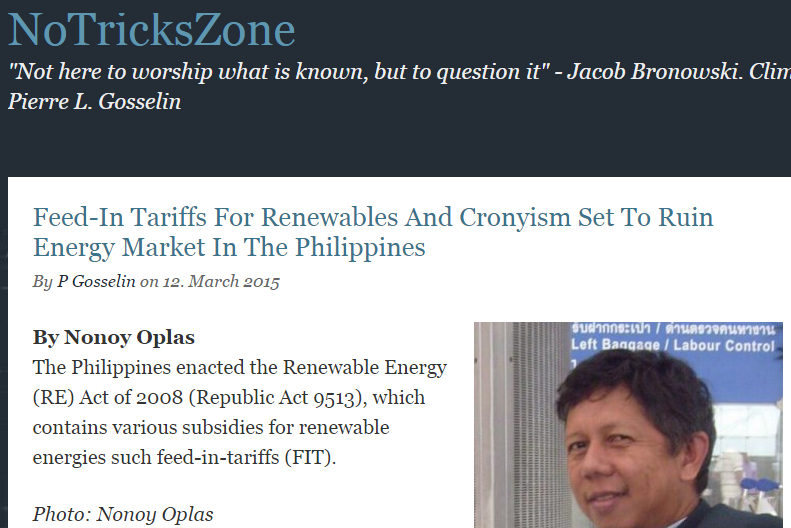 This will happen to the Philippines too, no thanks to RA 9513, the renewables cronyism law. Source: BDEW: Germany’s Electricity Price More Than Doubles…Electrocuting Consumers And Markets, 7 December 2014. What makes FIT a formula for ever-rising price of electricity? (d) compliance with the renewable portfolio standard (RPS). The RPS as contained in Section 6 of the law, is the minimum percentage of generation from eligible renewable energy resources to be set by the NREB. So combining FIT and RPS, this means that even if cheaper power from say Quezon coal or Sual coal, Magat or Pantabangan hydro, Sta. Rita or Ilijan natural gas are available especially during non-peak hours, but wind power from Ilocos are available, Meralco and the various provincial electric cooperatives in Luzon grid are forced to buy from the expensive wind power plants. While many environmental activists were among the groups that opposed electricity price hikes in the past, it is sure they will rein in their noise and militance now that their beloved renewables will be among the major contributors to rising electricity prices in the country. Double talk can happen anytime. Recently, the Department of Energy (DOE) announced 14 RE projects with combined capacity of 304 MW which have been endorsed as qualified for the FIT program. The DOE has issued certificates of endorsement (CoE) to five biomass, three small hydro, two solar and four wind power projects. This means that those power capacity will be dispatched to the grid at a fixed rate over a period of 20 years. The installations for RE power totaled 750 MW: run-of-river hydro and biomass projects at 250 MW each, wind power at 200 MW, and solar power at 50 MW, but may soon be raised to 500 MW. Aside from FIT and RPS, RA 9513 gives many other subsidies or relaxation of regulations and taxation to the renewable producers, privileges that are denied to producers of conventional but cheaper power sources. These privileges include: (a) Income tax holiday for 7 years; (b) duty-free importation of RE machinery, equipment and materials within the first 10 years; (c) special realty tax rates; (d) net operating loss carry over (NOLCO) to be carried for the next 7 years; (e) 10% corporate tax rate (not 30%),; (f) tax exemption of carbon credits; and (g) tax credit on domestic capital equipment and services. This author is not against renewable sources per se. They are fine, along with geothermal, big hydro, coal and natural gas. What is objectionable is the cronyism and favoritism granted to the renewables which results in an: ever rising electricity prices in the country. The case of Germany is already a guide for us. The same pattern is happening too in Spain and UK. Government intervention and cronyism in energy policy is wrong and counter-productive. Governments should get out of electricity pricing and stop forcing grid operators and electricity distributors to buy from renewables even if their rates are expensive. RA 9513 needs major amendments to remove the FIT and RPS schemes.